Yesterday at IFA 2012, Samsung unveiled their UHS-I Class SD and microSD cards capable in 64GB Storage capacity. Samsung unveiled a few 16GB UHS-I Class SD and microSD cards earlier this year but now they are showing higher 64GB capacity versions at IFA 2012. 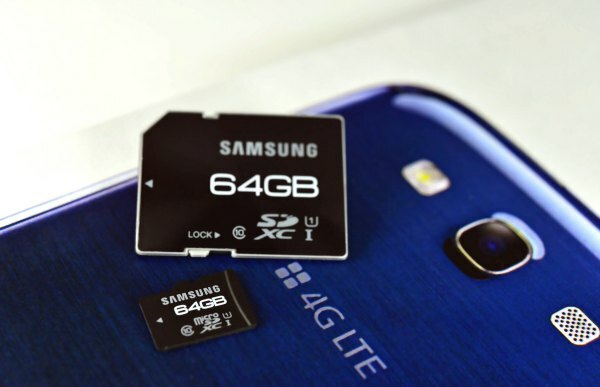 The new SD and Micro SD Cards are incredibly faster. Actually, they are almost 4x times faster then Samsung’s previous SD and Micro SD Cards. Samsung’s high-end “Pro” editions (meant for LTE phones and tablets) are capable of read/write speeds at 80MB/40MB per second (SD) and 70MB/20MB per second (microSD). That would be roughly equivalent to Class 40 and Class 20, respectively. These high capacity and high performance cards are great for Full HD video recording, HD still consecutive recording and for real-time broadcasts. Even though these Memory cards are blazing fast, they are still slower then NAND or Onboard Storage. We don’t know the exact pricing on these SD Cards but we think they will be on the expensive side. Samsung will make these new UHS-I Class SD and microSD cards available in Mid-October. Gs3 supports 64gb cards. Gs2 does not. Any word on jelly bean for gs3 yet ? This is cool! Will the Galaxy Note 2 support it? Does SGS3 int. support this Micro SD Card?